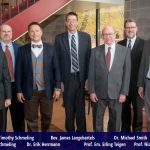 The fiftieth annual Bjarne Wollan Teigen Reformation Lectures were held at the Ylvisaker Fine Arts Center, Mankato, Minnesota, on October 26–27, 2017. These lectures are sponsored jointly by Bethany Lutheran College and Bethany Lutheran Theological Seminary. This year there were three presenters. The first presenter was Prof. Em. Erling Teigen of Bethany Lutheran College (BLC) in Mankato, Minnesota. Prof. Em. Teigen has served BLC since 1977. He received his A.A. from Bethany Lutheran College (1960), B.A. from the University of Minnesota (1962), B.D. (M.Div) from Bethany Lutheran Theological Seminary (1966), and M.A. in philosophy from the University of Minnesota (1978). He served Evangelical Lutheran Synod parishes in East Grand Forks and Apple Valley, Minnesota. Since joining the BLC religion faculty, he has taught courses in philosophy, dogmatics, American Lutheran history, Luther, and the Book of Concord. He has served on the Doctrine Committee of the ELS, as well as numerous other boards. He was editor of the Lutheran Sentinel from 1975–82, and a founding editor of Logia for which he remains an editorial advisor and contributing editor. He has presented papers at various pastoral conferences, Lutheran Free Conferences, and has published articles in the Concordia Theological Quarterly, Lutheran Synod Quarterly, the proceedings of the Pieper Lectures and the Congress on the Lutheran Confessions, as well as Logia. Prof. Teigen presently serves as the BLC Archivist and editor of Oak Leaves. Prof. Teigen has been a member of the Reformation Lectures Committee since 1978, and has served as a moderator and reactor for the lectures several times. In 2004, he presented a lecture on J. A. Ottesen of the Norwegian Synod for this lecture series which received an award from the Concordia Historical Society. In 2000, his translation of Letters from Leipzig, Sigurd Christian Ylvisaker’s letters to his family while studying in Leipzig from 1907–10, was published by BLC. He and his wife Linda live in Mankato. The second presenter was Dr. Erik Herrmann, associate professor of Historical Theology at Concordia Seminary, St. Louis, Missouri, and director of the Center for Reformation Research. He received his Ph.D. from the same institution in 2005 in Renaissance and Reformation Studies. Before being called to the faculty, he was an assistant pastor at Timothy Evangelical Lutheran Church in the Lindenwood Park neighborhood of St. Louis, Missouri. His areas of interest and research include the history of biblical interpretation, with a particular focus on Martin Luther and the Reformation period; history of medieval and Reformation/early modern Europe; twentieth-century interpretations of Martin Luther and his theology; and the history of American Lutheranism. His most recent publications are in The Oxford Handbook of Martin Luther’s Theology, The Oxford Encyclopedia of Martin Luther, and The Annotated Luther. He is married to Aliesha (née Ave-Lallemant). They are blessed with five children: Augustine, Constansa, Mathias, Tobias, and Elspeth. The third presenter was the Rev. James Langebartels of St. John’s Lutheran Church, Rib Lake, Wisconsin, and Zion Lutheran Church, Ogema, Wisconsin. Pastor Langebartels was baptized and confirmed at Trinity Lutheran Church in Crete, Illinois. He attended Northwestern College (1977) in Watertown, Wisconsin, and Wisconsin Lutheran Seminary (M.Div., 1981) in Mequon, Wisconsin. He also received an S.T.M. in exegetical theology (2008) from Wisconsin Lutheran Seminary, at the same service in which his son Matt received his M.Div. He and his wife, Shirley (née Marten), were married at St. Paul Lutheran Church, Tomah, Wisconsin, in 1978. Their marriage has been blessed with four children, all of whom attended Michigan Lutheran Seminary in Saginaw, Michigan, and Martin Luther College in New Ulm, Minnesota; two also graduated from WLS. John (Julie) owns Cornerstone Roofing in Wauwatosa, Wisconsin; Peter (Ann) teaches at St. Markus Lutheran School in Milwaukee, Wisconsin; Matt (Hannah) serves as a WELS pastor in Tucson, Arizona, and Rebekah (Neil) Birkholz supports her husband in Beijing, China. Jim and Shirley have also been blessed with eleven grandchildren. Pastor Langebartels served as a parish pastor from 1981 to 2015 at churches in Morenci, Hopkins, and Imlay City, Michigan. During his time there, he served for sixteen years on the Michigan District Constitution Committee. He translated numerous articles from the Quartalschrift for the anthology volumes of The Wauwatosa Theology (volumes 1–3, NPH, 1997); the first volume of The Complete Timotheus Verinus (NPH, 1998); the third volume (and portions of the first two volumes) of Adolf Hoenecke’s Evangelical Lutheran Dogmatics (NPH, 2003, 2009); Heinrich Schmid’s The History of Pietism (NPH, 2007); Luther’s Church Postils I–V (LW 75–79, CPH, 2013–16); assistant editor of Luther’s Sermons III–IV (LW 56–57, 2016–17); the four volumes of The Apology to the Book of Concord by Martin Chemnitz, Nicolas Selnecker, and Timothy Kirchner (first volume, CPH, 2018); and is currently translating Georg Mentz’s biography of Elector John Frederick the Magnanimous. Pastor Langebartels retired from full-time parish work in 2015 and moved to Milwaukee, Wisconsin, to be closer to some of the grandchildren and to put more time into translating, and now serves as the part-time pastor of St. John Lutheran Church, Rib Lake, and Zion Lutheran Church, Ogema, Wisconsin. His wife Shirley works as a librarian in South Milwaukee and Oak Creek, Wisconsin. 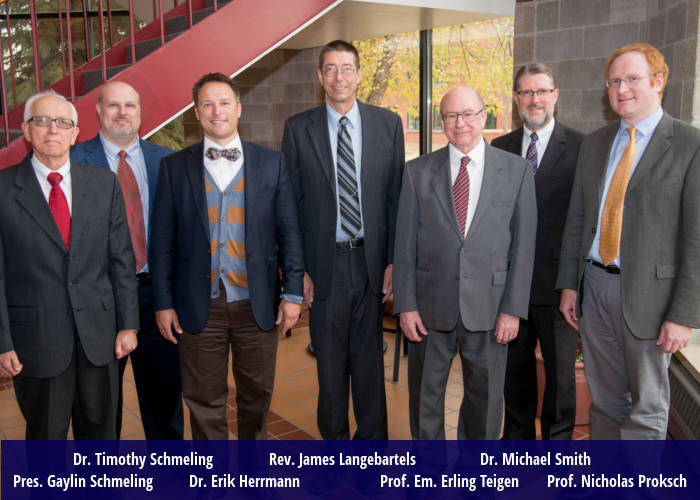 This year the theme of the Reformation Lectures was “Luther’s Three Treatises: The Reformation Platform.” The first lecture, given by Prof. Em. Erling Teigen, was entitled, “Address to the Christian Nobility of the German Nation.” In this treatise Luther demolishes the three walls of the Catholic church: 1. Temporal power has no jurisdiction over the church. 2. Only the pope can interpret Scripture. 3. No one can summon a church council except the pope. The second lecture, presented by Dr. Erik Herrmann, was entitled, “The Babylonian Captivity of the Church.” In this treatise Luther discusses the three captivities of the medieval church: 1. Communion in one kind. 2. Transubstantiation. 3. The sacrifice of the mass. He rejects the seven Roman sacraments and speaks of two: Baptism and the Bread (LW 36:124). The third lecture, given by the Rev. James Langebartels, was entitled, “The Freedom of a Christian.” Here Luther points out that the Christian man is a perfect lord of all, subject to none, and at the same time, the Christian is a perfect dutiful servant of all, subject to all (LW 31:344). The complete lectures will be published in the March issue of the Lutheran Synod Quarterly.